2011 Hesketh HZE Vectrix. Picture credits - Hesketh. Submit more pictures. The Hesketh HZE Vectrix combines innovation with passion to deliver the world�s most versatile electric motorcycle. Instruments: Central analog display and two side LCDs show speed, odometer, battery charge, estimated range and system status. Carrying capacity: Under-seat: 1.41 cu ft (1 full-faced helmet); Glove compartment: .21 cu ft; Optional top case: up to 1.66 cu ft. Comments: Battery: Nickel Metal Hydride (NiMH). Capacity: 3.7 Kilowatt/Hours. Voltage: 125V. Charger: 1.5kW on-board battery charger, 110V-220V (50/60Hz). Recharge Time: 2 � hours (80%). Discharge Cycles: 1,700. Estimated Life: 10 years/50,000 miles. Patented Multi-Function Throttle provides regenerative braking and slow-speed reverse. Ask questions Join the 11 Hesketh HZE Vectrix discussion group or the general Hesketh discussion group. Get a list of related motorbikes before you buy this Hesketh. Inspect technical data. Look at photos. Read the riders' comments at the bike's discussion group. And check out the moped's reliability, repair costs, etc. 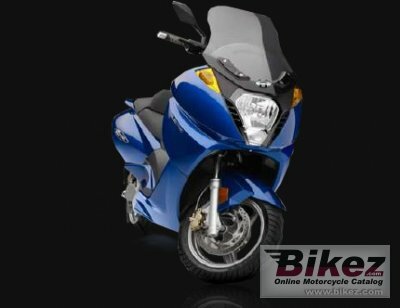 Show any 2011 Hesketh HZE Vectrix for sale on our Bikez.biz Motorcycle Classifieds. You can also sign up for e-mail notification when such mopeds are advertised in the future. And advertise your old MC for sale. Our efficient ads are free. You are also welcome to read and submit motorcycle reviews.